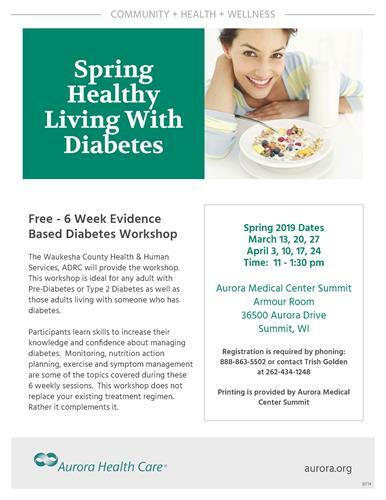 The Waukesha County Health & Human Services, ADRC will provide the workshop. This workshop is ideal for any adult with Pre-Diabetes or Type 2 Diabetes as well as those adults livig with someone who has diabetes. Participants learn skills to increase their knowledge and confidence about managing diabetes. Monitoring, nutrition action planning, exercise and symptom managment are some of the topics covered during these 6 weekly sessions. This workshop does not replace your existing treatment regimen. Rahter it complement it.